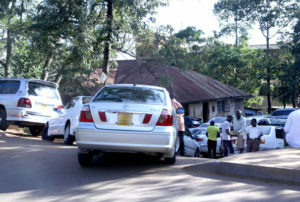 Cars and dealers at the land off which Ssebuwufu’s Pine Car Bond have been evicted. The Uganda Insurance Commission has taken over the land on which Pine Car Bond was located. Embattled car dealer Mohammed Ssebuwufu, who owns the car bond was leasing the land on Lumumba Avenue from the commission. However, when the lease expired this year, the commission declined to renew it. The commission instead, according to multiple sources, has started to construct an 11-storied building. When PML Daily visited the premises, Pine Car Bond had relocated to the open space, opposite to where he has been operating from. It is reported that businessman Sudhir Ruparelia owns the open land. The old structure has been fenced off with iron sheets and graders were busy levelling the ground. When asked about the development, Mr Ssebuwufu told PML Daily that his bond business has partnered with the commission to set up a mega building. “Once it is completed, we shall be using the basement. And for them, they will occupy some rooms, others will be for rent,” he explained. Sebuwufu added that he rented out Sudhir’s land because his business had grown and it needed enough space. “I decided to operate here because the basement will not be enough to house all the vehicles,” he added. In 2014, Kampala Capital City Authority (KCCA) tried to evict Pine car Bond from operating at the premises. The authority argued that Sebuwufu had established illegal parking lots along Lumumba Avenue. This prompted Ssebuwufu to sue KCCA and he won the case. Court then ordered KCCA to reward millions of shillings to Ssebuwufu. In 2015, things turned ugly on the side of the flamboyant Ssebuwufu, who together with seven others, were accused of kidnapping and torturing businesswoman Donah Betty Katusabe to death. It is alleged that Katushabe had failed to pay a Shs9m debt, which was the balance for a car purchase she had made from Pine bond. The murder trial is still ongoing at the High Court.